Fueled by a string of strong atmospheric rivers (ARs), California’s current winter-to-date accumulated precipitation has hit a new record high level, eclipsing the previous record set during the strong El Niño winter of 1982-83. The winter began with an unusual early season AR, which contributed 6% of normal annual California-wide precipitation over the period Oct 14-17. Strong AR activity continued in Jan and Feb 2017, with exceptionally strong precipitation Jan 8-10, which produced 14% of normal statewide annual precipitation in just three days and reached R-cat 4 intensity. (R-cat levels measure intense precipitation events; a fuller description of R-cat levels and this event can be found here). The AR during Feb 7-9 produced 9.5% of total annual California precipitation. Together, the latter two AR events produced nearly a quarter of an entire normal year’s precipitation in just 6 days, with each event including extreme intensity AR landfalls in the state. 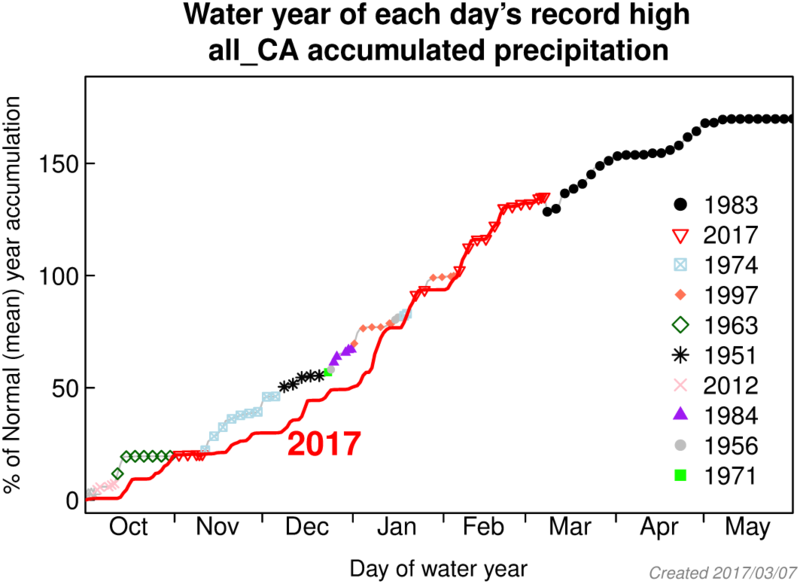 The figure below shows the water year (Oct 1st – the following Sep 30th) that holds the record for maximum precipitation in California accumulated since the beginning of October for each day of winter. The current water year, 2017, broke the old record in early February and has continued to be the record-holder up to the current date (first week of March). Currently, 1982-82 holds the record for the maximum state-wide accumulated precipitation at the end of May in observations that go back to 1948. The accumulation so far this year is above the pace of 1982-83, but 1982-83 received a significant amount of precipitation in March and early May. This figure shows California statewide accumulated precipitation estimated from 96 stations distributed across the state, but similar results are seen in the “Eight Station Index”, which uses eight stations in the Sierra Nevada selected for their importance to the state’s water supply. The eight station index is likewise currently at new record levels of accumulated winter precipitation, superseding the previous record-holding winter of 1982-83. The southern portion of the state, including the greater Los Angeles region and San Diego county, are unusually wet so far this winter but not at record breaking levels. For instance, the Los Angeles region received substantially more precipitation in 2005, which led to widespread flooding, infrastructure damage, and several deaths. The record-breaking precipitation has led to high values of snow cover, as shown by the yellow line (winter of 2016-2017) below. 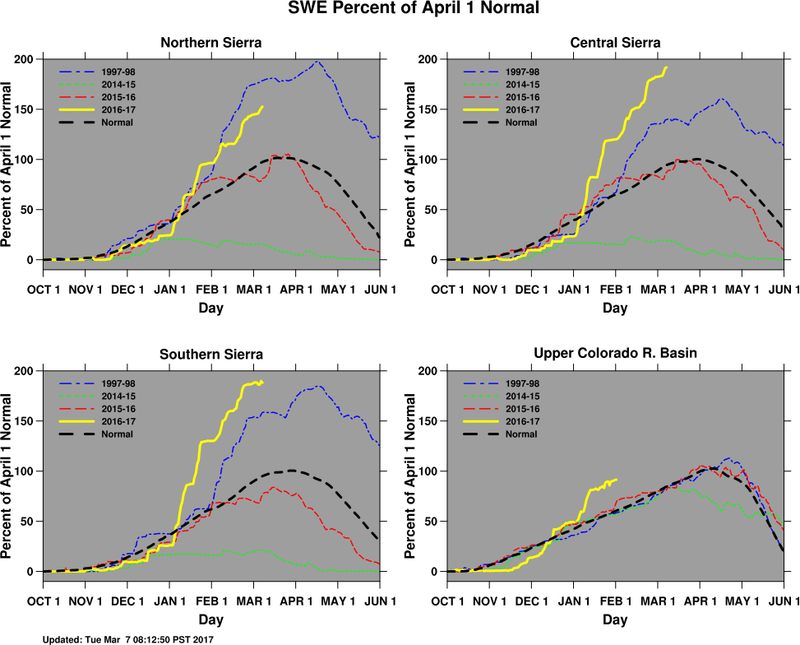 In the central and southern Sierra Nevada, current values are almost twice what is seen at the typical peak of snow accumulation on April 1st, and significantly above the high values seen during the El Niño winter of 1997-98 (dashed blue line). Snow is an important component of California’s water supply, since it holds the precipitation from intense winter storms, releasing the water more slowly via snow melt.